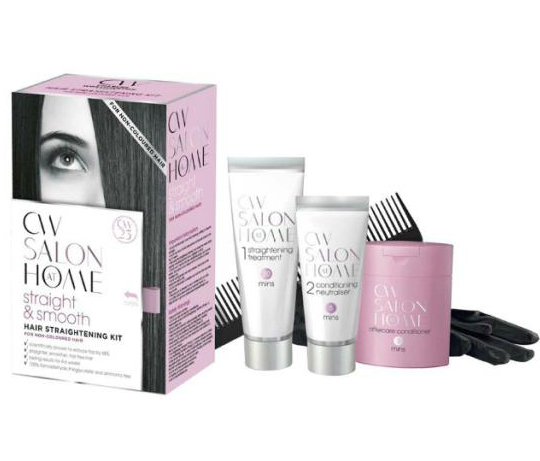 When my all time favourite beauty junkie, Jen, asked me to try out the ‘Charles Worthington Straight and Smooth Hair Straightening Kit’, I jumped at the chance. It is my lifelong quest to achieve straighter, healthier looking hair without having to spend hours blow drying and straightening. The kit is available at boots only, for £19.99. It comes with the straightening treatment, a conditioner which activates the treatment, an after care conditioner, gloves and a comb. The instructions are so straightforward it would be impossible not to understand how to do this. The most difficult part of the process was actually the fact that the product has to be applied to wet, shampooed but not conditioned hair. Using the comb I eventually worked out the tangles from my unconditioned hair (which, trust me, is not an easy task) and was ready to apply the treatment. The treatment is easy to apply (from the roots to the ends of the hair) but is probably best done in the bathroom if you aren’t the most careful of people (like me), as it can be a bit drippy. The instructions warn that the product will have a ‘particular’ smell which indicates that it is working. This concerned me somewhat. The ‘particular’ smell seemed familiar to me but took me a while to identify. Eventually, I realised it reminded me of the smell of wee after eating lots of asparagus … I then understood the use of the euphemism ‘particular’ on the box. The smell is fairly mild and wouldn’t put me off using the product again, but it’s definitely there. After leaving the treatment on for 20 minutes (and removing the peg from my nose) I rinsed and applied the conditioner for 5 minutes. Couldn’t be easier! Since using the treatment (now 3 months ago), I have rarely felt the need to get the hair straighteners out for more than a quick finishing job and I have often let me hair dry naturally and been very happy with the result. I’m now starting to feel like it may be worth repeating the treatment, but overall I’m really impressed with how long the effects have lasted (almost as well as the Brazilian blow dry – which I have tried before). This treatment has saved me so much time on blow drying and straightening my hair and I would definitely go out and buy it again, especially as, compared to a salon Brazilian blow dry treatment, it’s an absolute bargain. Thanks Jen for introducing me to this great product! Product was a PR sample. Previous Post I need your ideas! I stopped blow drying my hair a few months ago and am currently on ‘straightener strike’ EVERY time I used to wash it (which was daily) I would use both. My hairdresser advised me to stop it and I did and now I don’t need either! Worth persevering with and your hair becomes so much healthier in the end. I’m still not sure about the price tag on this product! I guess I’m luckily bless with naturally straight hair… though I’m always leeming for Blake Lively type waves. That last picture showed such a difference! Nice to know some products do live up to their claims. Also, I’m having a HUGE blog sale at the mo with brands like Bobbi Brown, Stila and Lush. Prices start from £1. I have very thick, wavy hair and I was tempted to try this but I’v realised it’s not for me: after years of straightening, blow-drying etc, I’ve realised I don’t want straight hair, I want smooth hair with a bit of body. Having said that, if it helps to minimise using straighteners (for those who like straightened hair) then it can only be a good thing: less time consuming and healthier hair! Great review!! I used to straighten my hair to often and my hair got so damage, I started to use the Pro Naturals hair care system and my hair changed a 100%, now my hair is so soft and shiny…its really good that this kind af products exist! !